"#1 in customer satisfaction, ask anyone!" Nearly nine out of ten transmission failures are due to overheating and fluid contamination, according to the Automatic Transmission Rebuilders Association. Just like the oil in your car's engine, automatic transmission fluid (ATF) suffers from heat, friction and contamination degradation. Once this process starts, your transmission's vital parts begin to clog with sludge and varnish deposits. Unlike the oil in your car's engine, most of the transmission fluid doesn't drain into a pan. Instead it stays in the torque converter, valves and cooler lines making a complete fluiddrain impossible. 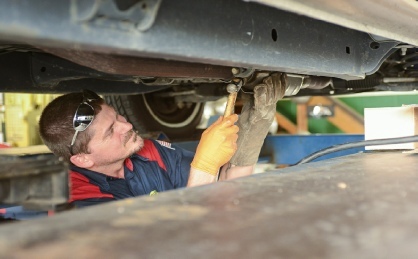 In fact, the typical transmission service only replaces as little as 25% of the contaminated, used fluid with fresh ATF. According to ATF manufacturers, the addition of new fluid to contaminated fluid can actually cause sludge and varnish deposits to clog filters and restrict the flow of transmission fluid.This can result in a serious malfunction, or even complete failure of an automatic transmission. Now there is a better option. Wynn's has developed a process that safely removes varnish and sludge deposits and cleans all internal transmission components including the transmission cooler and torque converter. This service is also the best way to remove wear metals that are slowly grinding away on your transmission's internal components along with most of the old, contaminated ATF. Your car's transmission is thoroughly cleaned and protected with fresh ATF and conditioners that revitalize the seals and O-rings in the transmission. Safely remove harmful sludge and varnish deposits. Remove contaminated fluid from transmission system. Revitalize transmission seals and O-rings. Help stop and prevent leaks. Help smooth rough, hard shifting problems.